There are a ton of old Mercedes still out on Morocco’s roads. They must each have around a million miles, and they are beautiful. Not particularly beautifully taken care of by classic car standards, but you can tell that they have each been loved well by their owners over time. European tourists ride around in massive Jeeps with snorkels, or those monstrous world tour adventure RVs with massive wheels and a motorbike attached to the back. But well-to-do locals often drive these ancient Mercedes, or even older Renaults. There are also a vast array of different motorbikes, of all different shapes and sizes. From tiny Motobecanes, to touring motorcyclists riding massive BMWs. Also the occasional mule or horse. 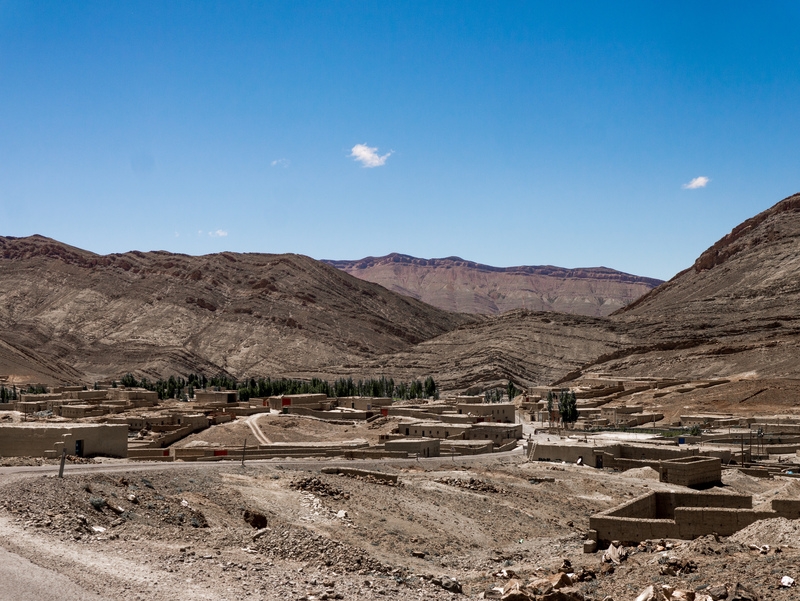 A city in the High Atlas. Imilchil, maybe? Lake Tislit. With a nice restaurant, at high altitude. It is right before Imilchil, and it’s highly recommended. This late in the Spring, much of the water sources in the countryside have dried up. Dry, dusty lakes and creekbeds. I’d say if I saw a water source on my map, chances were about 10-15% that it would actually have water in it. After the first night, we learned not to trust mapped water sources, unless they were confirmed by someone we met in passing. Sometimes not even then. 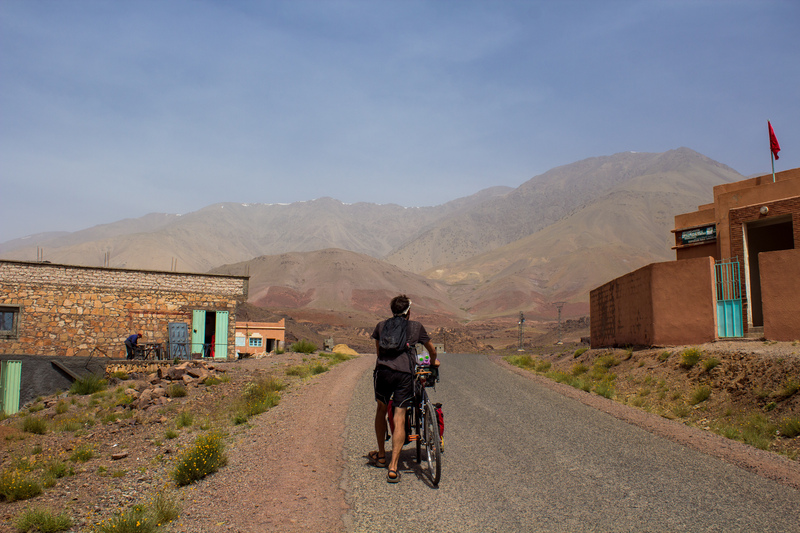 However, on one of our first days in the true High Atlas, we ran across probably the most pleasant surprise of the trip. A large lake, not dried up, at about 8,000 feet. I’m still not quite sure why it was there. 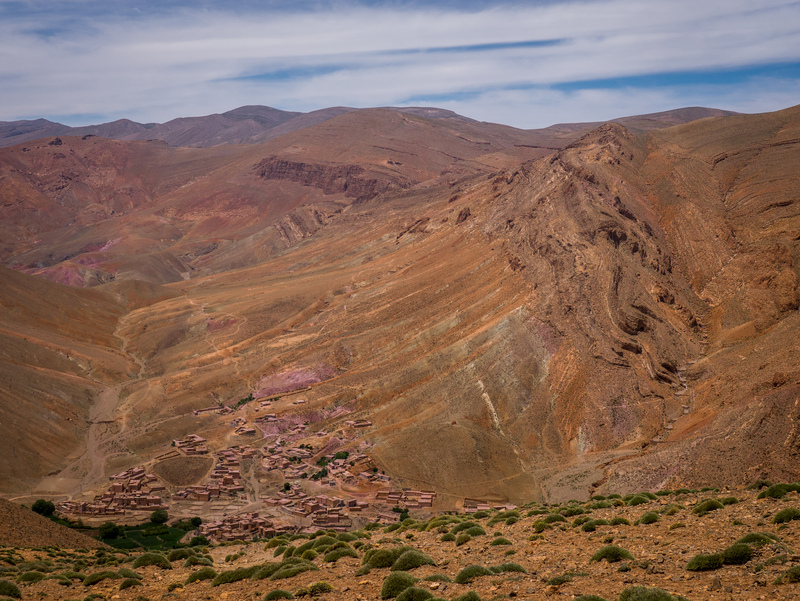 For these few days in the High Atlas, we did not drop down below around 6-7,000 feet, and went as high as almost 10,000. 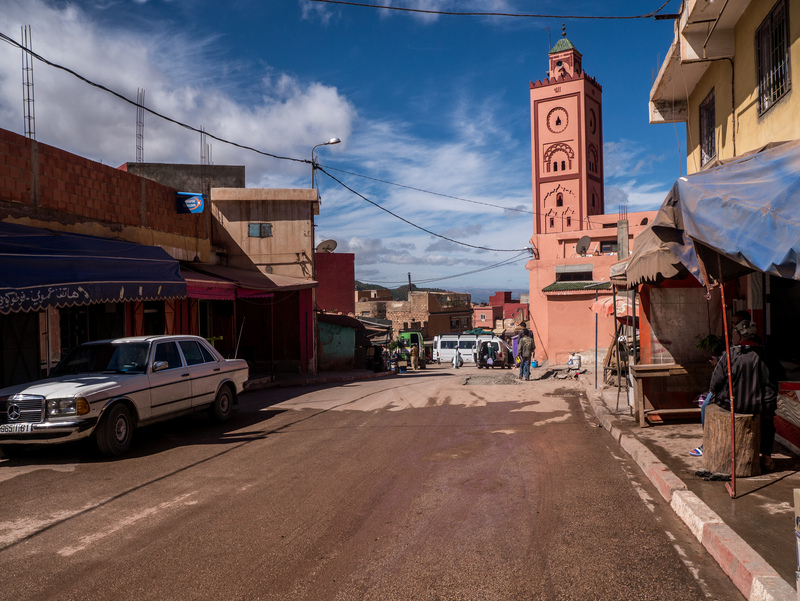 Towns were sparse, and when they did exist, they were tiny, barely even one-horse towns with hardly any services beyond a restaurant, a minimarket selling candy and water, and a mosque. If the town showed up on my GPS, it would be nothing more than a grey, unnamed spot. These towns would typically be clustered around water sources, with wheat growing in a strip of green, arable land next to the river, and the town and houses adjacent to the farms. The fig trees from the Mid-Atlas disappeared, and left tiny hand-farmed wheat and mint plots. The standard construction material of houses within the towns deteriorated to just hand-moulded clay. Then, one day there were no houses and towns, only shepherd’s huts and flocks of sheep. And climbing. Always climbing. Downtown… I don’t know. Agoudal? Vans passed us going up passes with flocks of sheep and shepherds balanced on top. Every once in awhile, a truck would pass loaded up, teetering, with who-knows-what crop. Or a massive load of firewood, and so laden that it would be traveling about as fast as we were cycling. A bulldozer separated from its trailer driving along, presumably because the trailer with the bulldozer was too hard to navigate along the road, which was literally carved out of the side of a cliff. Another horse. 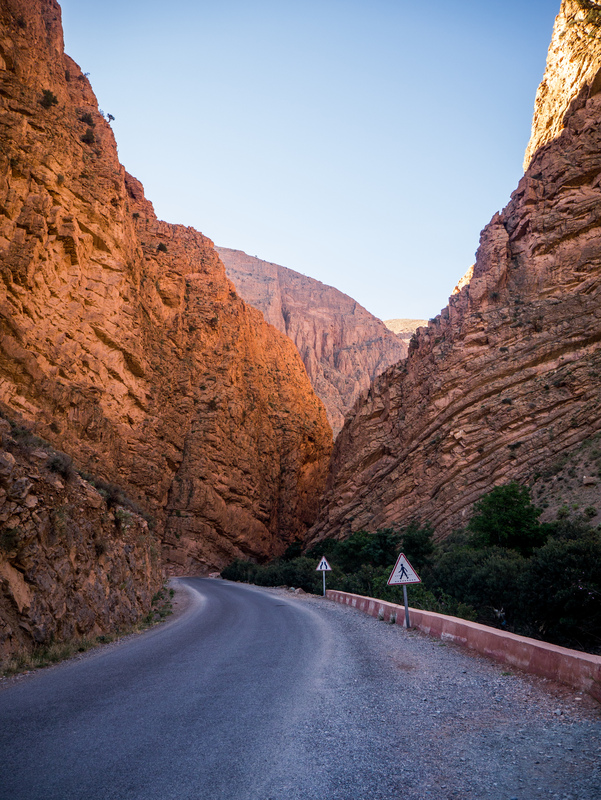 Some of the roads up in the High Atlas were engineering feats in themselves. Many of them were listed on dangerousroads.org. 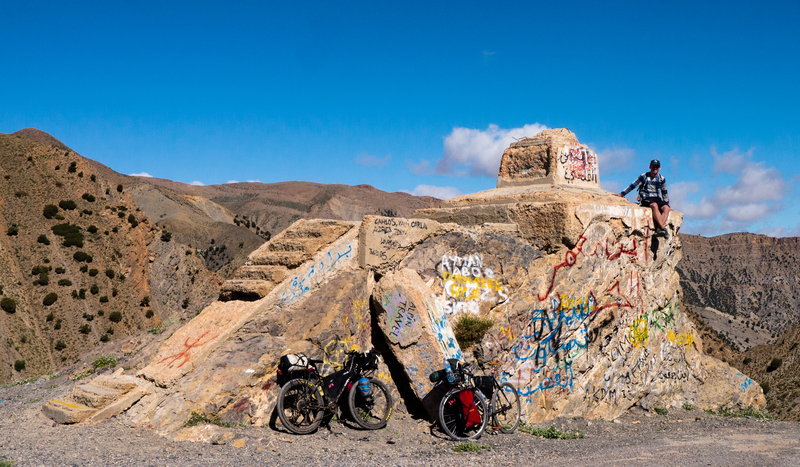 (That site, by the way, is a fantastic resource for finding remote, long distance bike routes) Tizi n’Bab n’Ouyyad and Tizi-n’Ouano, both listed, were the main passes we traversed. 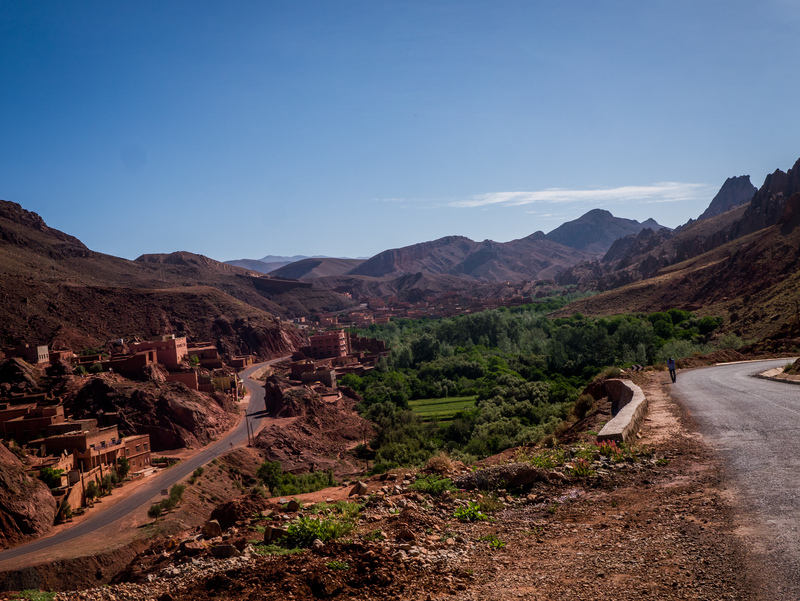 At the town of Agoudal, we turned towards the Dades Gorge and over our final pass of the Atlas mountains. After a morning of climbing through one more desolate landscape, we reached our peak and spent the rest of the day descending into the Gorge. Massive striations in the surrounding peaks gave the sense of being in a Dali painting, with everything around us seemingly melting in the sun. Some motorbikers passed us, and took our picture nearing the top of the final pass. This town was, from a distance, purple. From the color of clay underneath it. 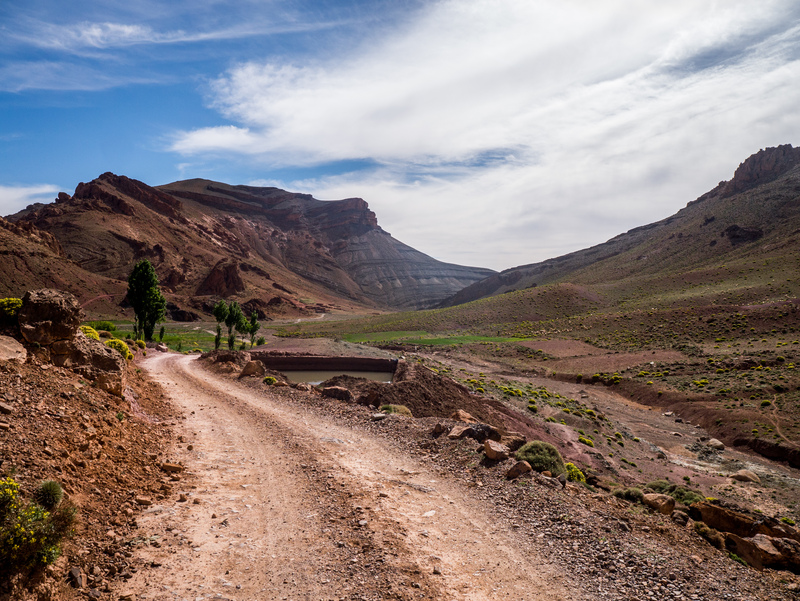 The road along the Dades Gorge returned to the up-and-down, but slightly more down than up rolling hills from a few days earlier. Again, totally ruining what was supposed to be a fantastic, slow descent from our peak. More roads cutting through rock formations and along sheer cliffs. This entire section of the trip, from the pass to the Gorge, had previously been described as “particularly dreamy”, and it really was. The views were spectacular, although the riding was tougher than I had anticipated. Further down the gorge, there was more tourist infrastructure. Trekking routes, hotels, the usual. 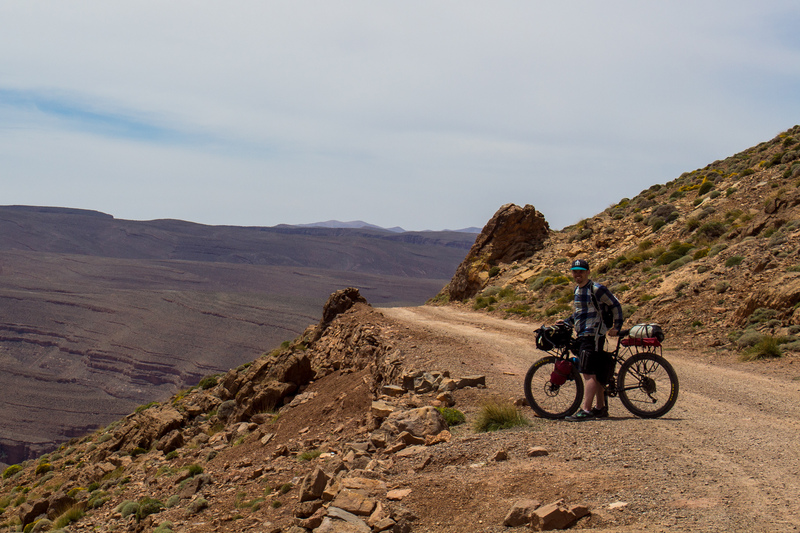 One of the next days, the road turned largely flat and we did our longest day along the edge of the Sahara. 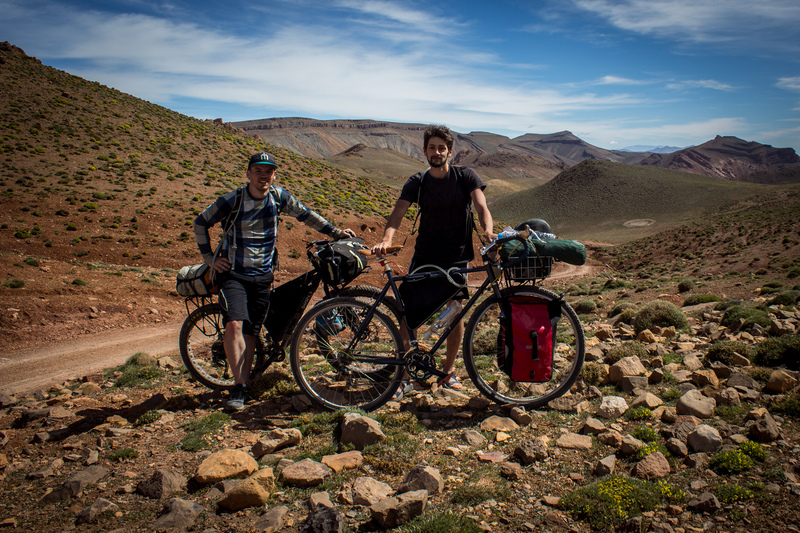 90 miles under the hot, hot sun, to Ouarzazate. 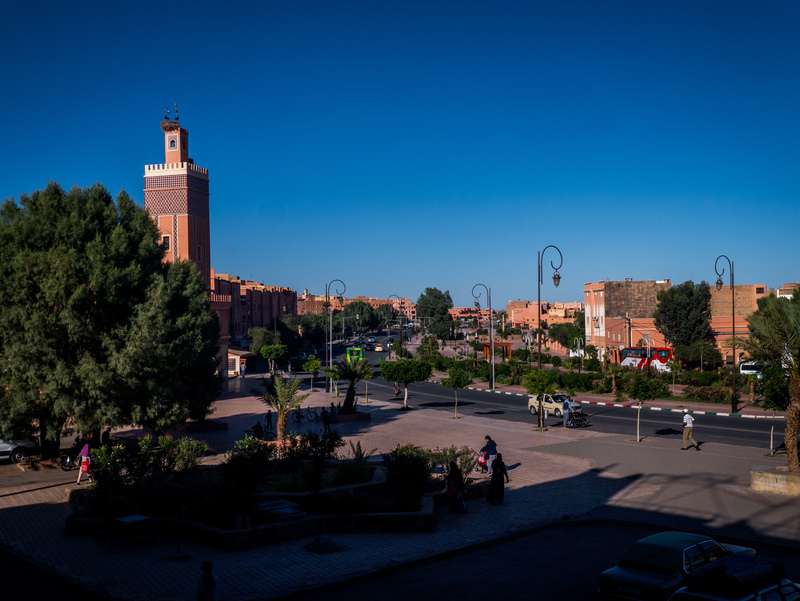 Ouarzazate is the “Hollywood of North Africa”, with a few movie sets just outside town. Also, solar installations. 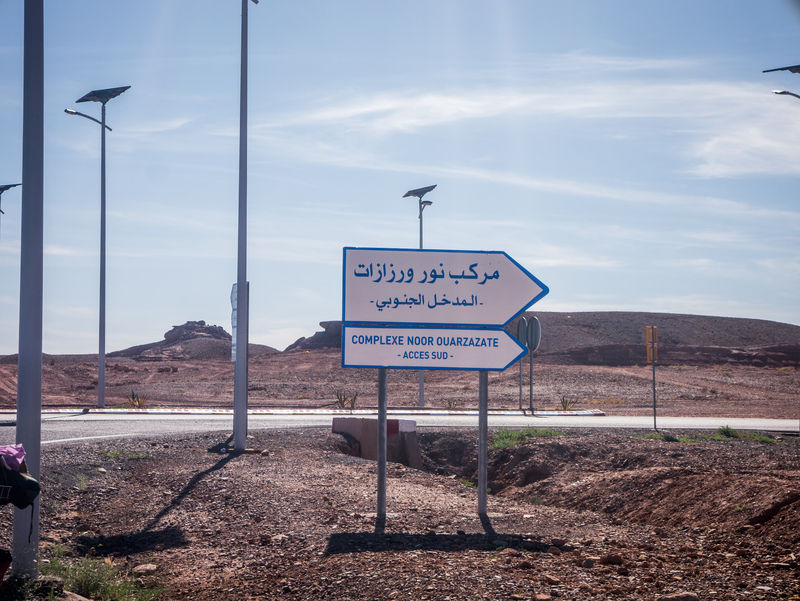 A large solar complex outside Ouarzazate. 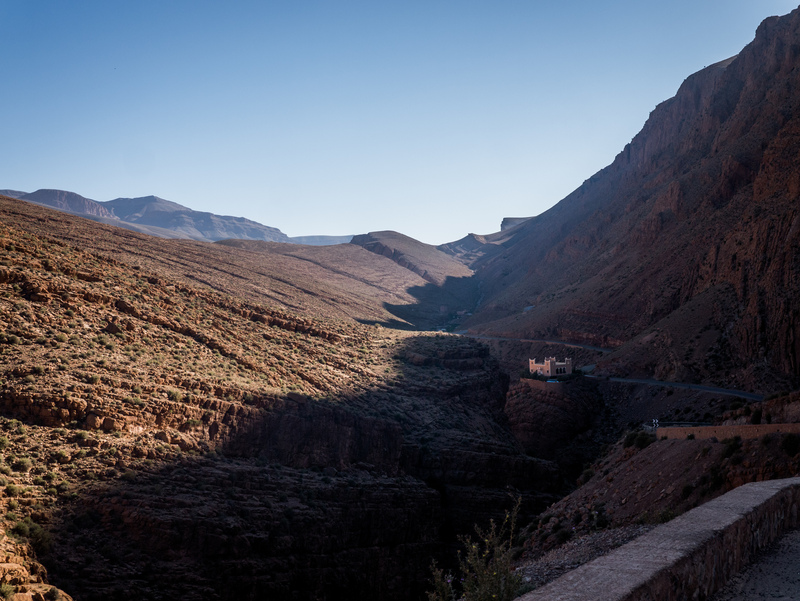 After Ouarzazate, we went north to a small road past the highest peak in Morocco, Toubkal. 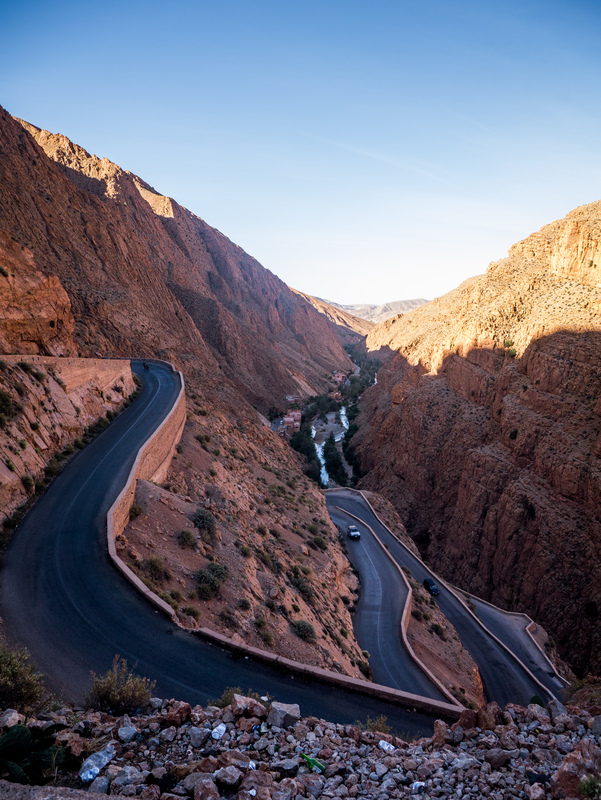 This last climb and descent was sort of ruined by a haze which settled into this region of Morocco, which prompted endless speculation about the cause. Nonetheless, it made for pretty hellacious riding for the last few days of our trip. 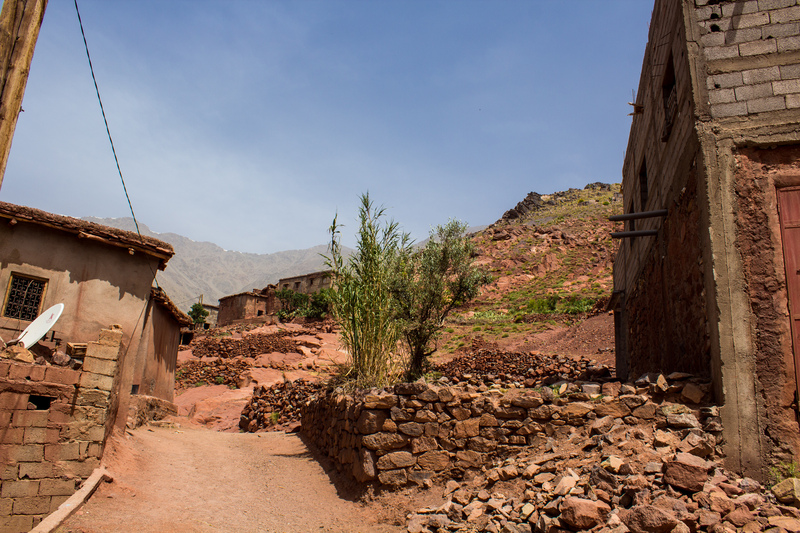 The view of Toubkal was barely visible through the haze, and there wasn’t much of a breeze. Made worse, this was some of the bleaker areas we were in. 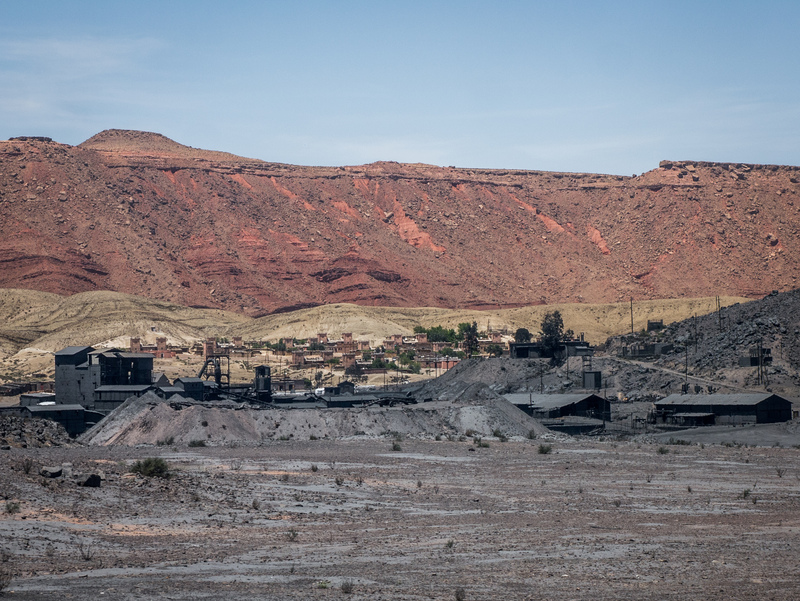 One morning, we turned off the national road for a shortcut and ran into the middle of an operating coal mine, complete with black coal dust coating everything, workers coated in black dust rinsing off at a central pipe, and a foreman, who knew English and asked us how we were. It was a sort of absurd hour or so of our day. The towns along this road (I don’t know its name) were also pretty bleak. 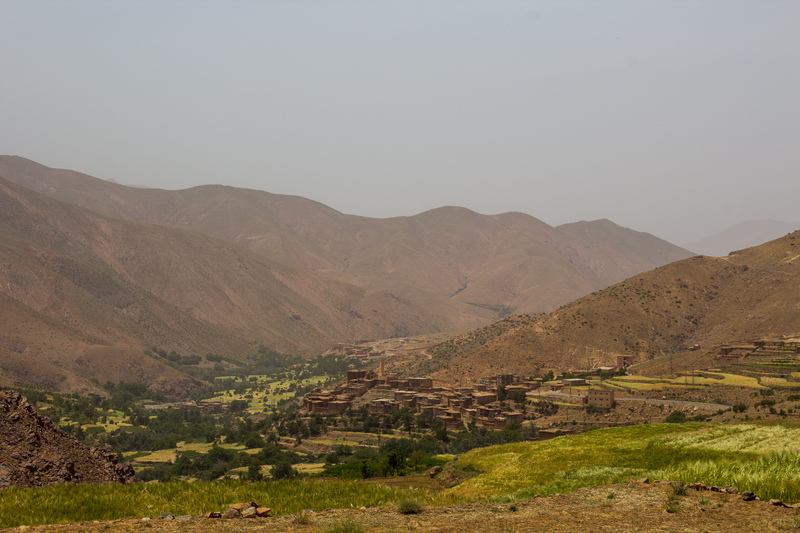 They were very traditional, one-mosque towns, living off of a small strip of green along a long, seemingly endless valley. We didn’t actually, in all honesty, see many people at all. We couldn’t decide whether the towns across the canyon from us were deserted enough. My paper map didn’t show these towns, and my GPS only marked them with an unlabeled + sign. There were no minimarkets, the drinks were not cold, and the riding was just getting hotter and hotter as we finally started descending to the coast. The awful haze. Stagnant air. So after some tough days, we decided to trade a day riding for an extra day at the beach. 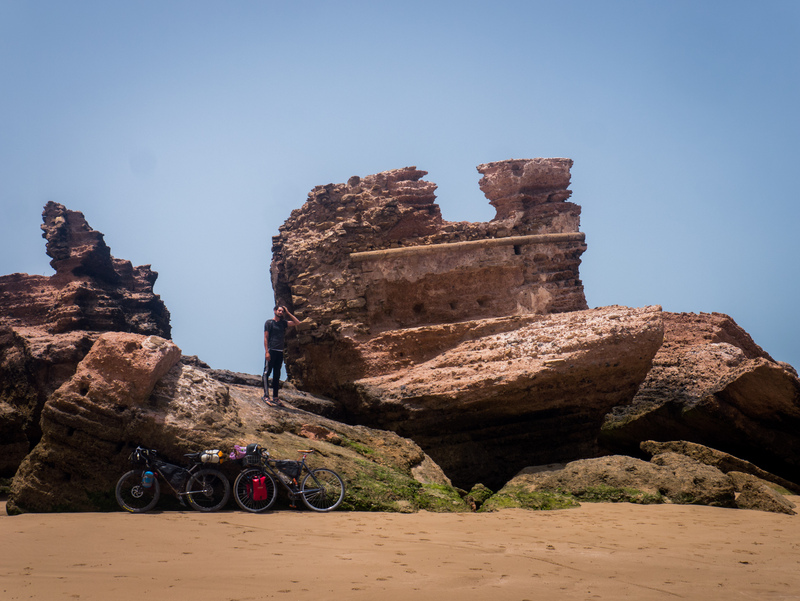 We took a bus from about 100 miles from Agadir on the coast, foregoing what promised to be a pretty nasty day of large road riding. We made two stops, splitting nights between Agadir and Essouiera before bussing back to Casablanca on a late night bus. And that’s how we ended up at 4am, in a square in Casablanca, waiting for a hotel to open which had been storing our stuff. It was a great trip. Everything just sort of went according to our plans. Got our mileage done, stuck more or less to the route I had planned, and were pretty lucky with bus schedules and other stuff out of our control. Morocco is a great country with a lot of very welcoming people.